Interact Scratchpad is a tool to easily and quickly create rich, complete contact records from plain text. Copy text from email signatures, web pages, or any document, and let the Interact Scratchpad turn it into a contact for you! Interact sits in your menu bar, or is available in the “Share” contextual (right-click) menu on text selections. 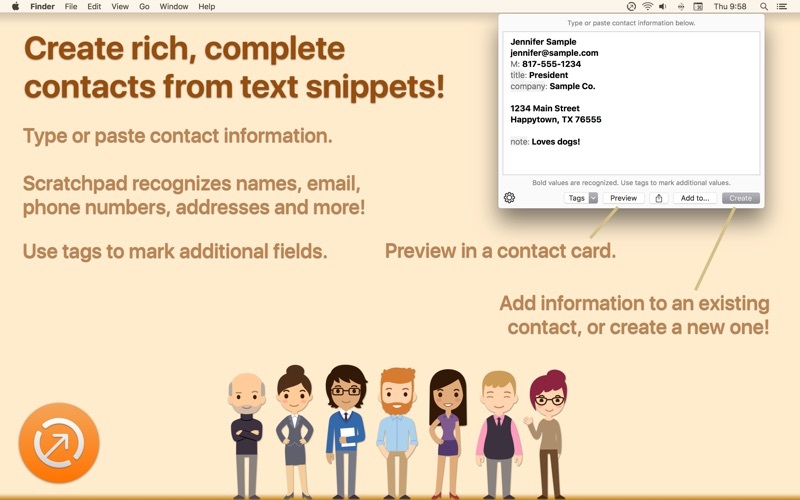 Simply type or paste in text snippets of contact information, and Interact will parse it in complete contact records. Interact automatically recognizes many common contact values, including names, email, addresses, phone numbers, company names. Insert simple tags to mark additional values. Recognized values appear in bold. Interact works with your system contacts account, so no configuration is required. Preview the resulting contact card. Create a new contact with the information. Add the values to an existing contact record. Export a vCard format version (without the need to add it to your Contacts). **Change:** Add cmd-T keyboard shortcut for tag menu. Next story Video Editor Movavi 5.0 – Easy Movie Maker. Previous story 1Password 6.8.3 – Powerful password manager.